Get up to 50% off. Special deals and discounts on Prom dresses and suits. Get an additional 50% off until 4th of July, Summer Love offers until 7th of July along with additional discounts for Banana Republic Card, Gap Card, Old Navy Card or Athleta Card. Get up to 70% off in-store on popular designs and styles. Get up to 40% off with an additional discount when you use your Gap, Banana Republic or Old Navy card. Get $4 deals from H&M for the 4th of July. Pick up shoes from over 40 styles for just $4. Get 30% off in-store on all sale items through July 5th. Get a variety of deals and discounts on different items summer wear, novelty treats, kids wear, pet care and lots more. Get 50% off, buy 1 get 1 free. Get 50% off when you buy 2 or more. Also check out the variety of deals and discounts. 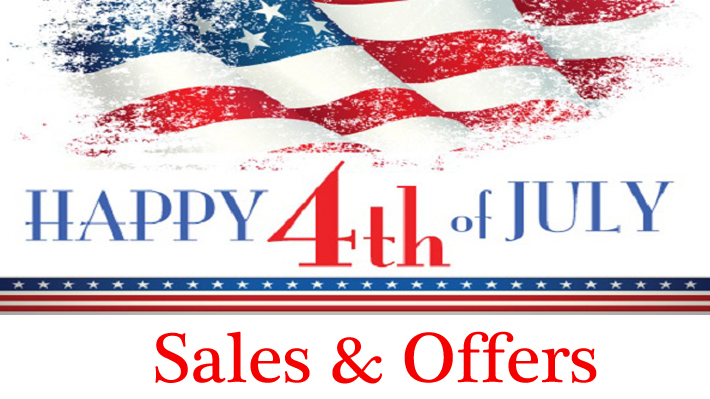 Get up to 50% off for the 4th of July. Also other deals and discounts available. Wish you a very happy 4th of July!